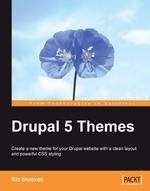 Earlier this month, I got a copy of "Drupal 5 Themes" for some reading pleasure. I just arrived to the end, and after submitting a bunch of non-major errata entries, I thought it would be a good idea to share my thoughts with you. A lot of people wondered in the drupal.org thread whether such a book is any valuable now that Drupal 6 is out. Well, after reading it through, I can state as well that it certainly has value for people interested in a comprehensive Drupal theming introduction. Book publishing is not a quick process, the CSS reference of the book was updated for Drupal 5.2 (admittedly not much changed in later versions as far as CSS goes, if anything), and the author mentions writing parts of the book while Drupal 5 was just briefly out. Implementing ground-breaking changes is not much easier however, so Drupal 6's new theme flexibilities and features does not require unlearning Drupal 5 knowledge. People familiar with Drupal 5 theming will be able to pick up the new stuff in Drupal 6 much more easily. Back to the contents of the book, the various chapters definitely provide a decent introduction to Drupal 5 theming. While I don't agree with some approaches (like the chapter on starting a theme from scratch really starting from empty files instead of copying default PHPTemplate files over), the book gives lots of tips which are hard to pick and gather from the Drupal forums. The author also takes liberty of reiterating some basic points multiple times, so it is easy to jump into relevant chapters (eg. modifying an existing theme) without reading all the others. This might feel like a bit too much repetition for people reading from start to end however. The pages include lots of reference material, like the last chapter with a listing of major forms to theme or chapter 4 completely filled with a list of themeable functions. I think these would have been better put to the appendix as reference chapters, but they are findable where they are nonetheless. The book does not delve into advanced style sheets and layouts, so the examples provided are of the really basic looks. Those looking for creating top-notch themes still need their own creativity, but this should not be much of news for anyone. The book strives to provide a picture on how HTML and CSS attach to Drupal not how one does things like Sliding doors (a CSS technique) or SIFR (Flash text replacement) work. The author also skips advanced Drupal topics like how to use color module in your themes, although this does not feel like missing since color module would only be used in contributed (reused) themes most of the time, definitely not in purpose-built site themes. The themes produced in the book examples will not compete with Garland regarding their looks either. Even a site building recipe is included, with things like block visibility settings, custom blocks and some essential blocks explained; showing off that building a site theme is not a generic task most of the time, but it needs to consider site specific needs including blocks, menus and settings even. So all-in-all I'd recommend this book to all, who are new to Drupal theming, and would like to get a head start on integrating their HTML and CSS techniques to Drupal. Been waiting for the PDF version of the book. For whatever reason, Pakt decided not to provide that. Too bad. I asked them about that and they've apparently stopped PDF versions entirely for a while so they can "investigate copy protection mechanisms". Apparently distribution of them got so rampant that they killed it altogether, temporarily at least. PDF ebook version is available now. I got the book a few days ago and after skimming through it, wondered if the book was really worth the money. Now, I know it will help someone like me who is new to theming. Hope to see similar one but for Drupal 6 ("Drupal 6 Themes"), soon. And of course, pdf version is preferred, (it's searchable !). I love your book review. I want to share my review which can be found on this link.